It is a curious thing that there are only a few contemporary trumpet players who strongly draw on the legacy of the late great Miles Davis. Ambrose Akimusire, originally from Oakland, California is one of those few. Best known in this country for his collaborations with pianist John Escreet, he plays with fire and fearlessness, conjuring up a storm of energy and creativity. Ambrose is appearing at Ronnie Scott’s next Wednesday for one night only, playing music from his Blue Note Records debut ‘When the Heart Emerges Glistening’. The album showcases his explorative and lyrical writing, with Akimusire’s trumpet supported by Walter Smith III on tenor, and a rhythm section of Gerald Clayton, Harish Raghavan and Justin Brown. 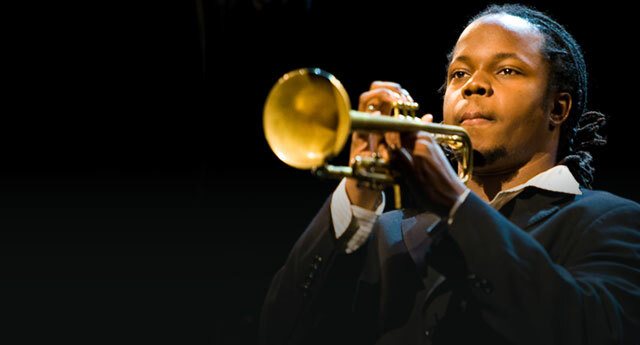 London’s jazz clubs have recently been graced by some of the finest emerging US trumpet players, including Peter Evans and Jason Palmer. Ambrose Akinmusire’s visit may be the highlight of a very exciting month. True, every horn player since Miles has been influenced by him (and in fact not just horn players by any means!). I was referring to the fact that most players (and a good selection from your list) have Freddie Hubbard or Clifford Brown rather than Miles as their overarching trumpet influence. I've always found that interesting. There aren't many trumpet players around (comparatively) really taking the baton on from the late Miles thing. Of those that do, I'd put Ambrose and Dave Douglas pretty close to the top of the list!